Abu Dhabi, UAE (WAM) — Ettihad Airways has added to its fleet five new Boeing 777-300 at a total cost of US$1.9 billion, according to a press release from the company. The Abu Dhabi government's national airline is expected to take delivery of the first batch of the five long-haul planes this year as one plane would be delivered to the airline in October this year, while the remaining four would be delivered in November and December 2005. 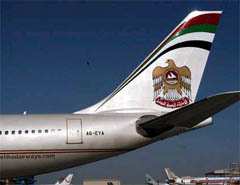 The launch of the Abu Dhabi-Manama route by the Ettihad Airways Aug. 21, 2004 opened up new avenues of tourism, trade and investment cooperation between the United Arab Emirates and Bahrain. "Despite its novelty, the Ettihad Airways has gained good reputation in a short span of less than eight months," Abdul Aziz Hadef Al Shamsi, UAE ambassador to Manama, told WAM . He anticipated that tourism and trade exchange between the two countries would grow as a result of operation of the new route. Meanwhile, a senior official at the Ettihad Airways said the launch of the Abu Dhabi-Manama route is a first step in the direction of introducing similar services between the UAE capital and its GCC counterparts. "Contact is currently underway with the Civil Aviation authorities in the GCC countries to operate direct flights from Abu Dhabi to their capital cities," said Khaled Al Muhairbi, director of Ettihad Airways' International Relations. He said his company had a comprehensive plan for gradual expansion of its route network with priority to be given to new stations. He added that Ettihad had in less than a year operated regular flights to Beirut, Amman, Damascus, Colombo, Bangkok, London, Geneva, Munich and Manama. Another new route to Gatwick Airport in UK and Mumbai will be launched in September. Muhairbi said Ettihad had contracted to purchase 24 Airbus planes at a cost of $7 billion with a wide range of options to buy extra 12 aircraft.